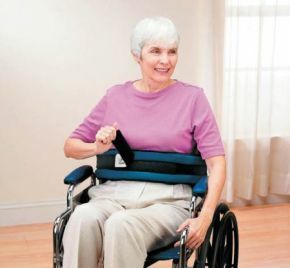 Padded Wheelchair Lap Belt With Thick Foam For Comfort. is used in a wheelchair to prevent users from sliding forward. Supplied with an easy-open hook and loop closure, located at the front of the belt, allowing users to remove the belt when needed. Strapping: 2080mm (81 3/4") long, 50mm (2") wide. Padding: 660mm (26") long, 100mm (4") wide. This product is excellent and very comfortable for my husband. Unfortunately I was sent the wrong item and it included straps which went over the shoulders. This wasn't a problem, however, as I simply cut them off and made them into another very comfy strap to help keep my husband's legs in place. Thank you!